The perfect monitor for translators! THIS is going on my 'to buy' list! This is certainly going on my next 'to buy' list! No more need for dual screens! OMG, yes, please! Will totally go on my "Buy" list as well. Thank you so much for sharing! In fact, translators spend very long time sitting and concentrating on monitor screens. I find this type of monitor tiresome [my experience with monitors for stock exchange sessions]. My neck pain became worse due to a very large screen. Switching among multiple monitors work better. In addition, my 7 monitors I has mistaken and bought in 2000 still function well [but they will be sold cheaply] and durable in my workspace. I do not to waste them. I still insist on the classic multi-monitor work environment. A deeper desk would be better, though, than the one pictured, so you won't be so close to the screen. The way it's curved looks like it might be ergonomical enough. The best way to know is to stand in front of one "in person"! I find some problems with such a large monitor. 2) As Molly indicated, a deeper desk is needed, and not just any desk. 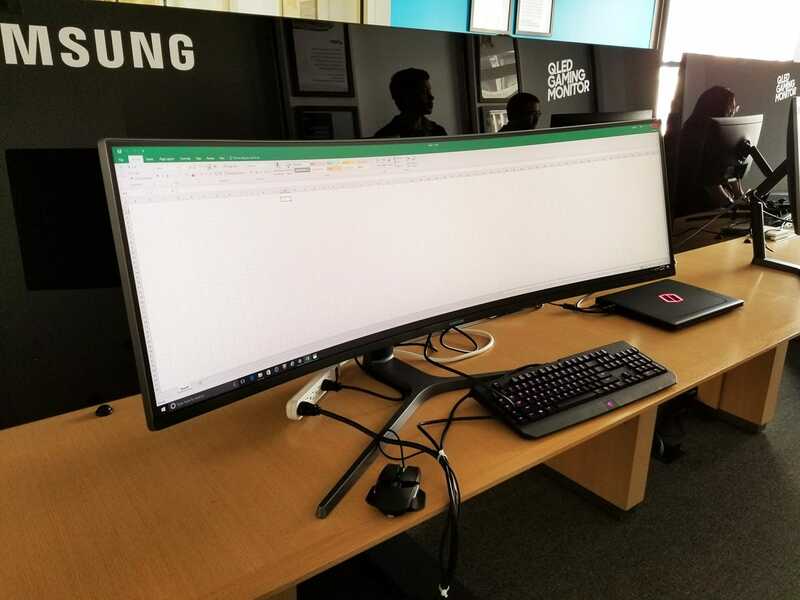 This monitor must be very heavy (the website doesn't say). 3) The monitor has a fixed position (on a tripod, as seen on the picture). Bad for ergonomics. 4) The monitor is designed for the gamer, not necessarily for others. As usual, it helps to see if this humongous monitor ($1,500, ha!) is compatible with your current system. I never say "Oh, my God!" and dislike it when people abuse of "Oh, my God!," but nevertheless... "Oh, my God!" ...but I prefer using 3 separate monitors for the same effect, which can be turned on/off as needed. 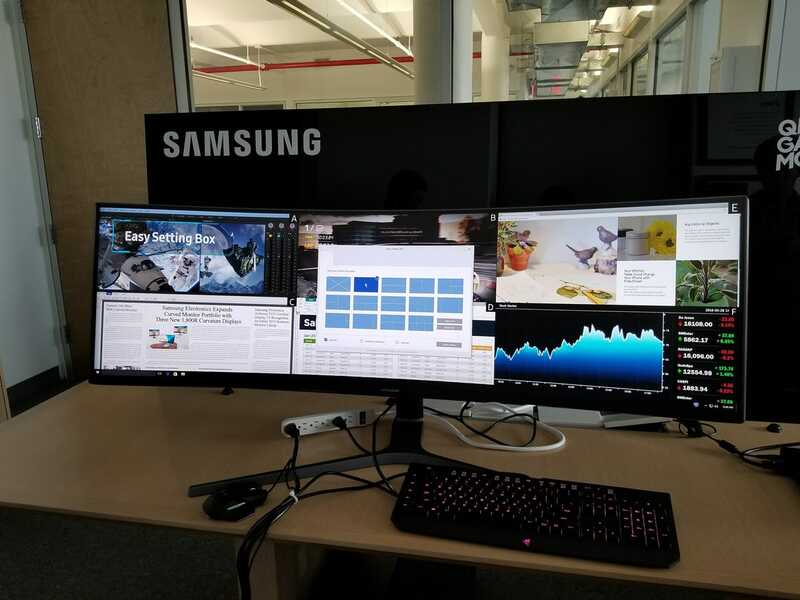 I can attest to the fact that a 49" monitor is worth having - I use a Wasabi Mango UHD490 all day, every day - and for me one large screen is better than two or three small screens, but the Samsung monitor to which you link is limited to 3840 x 1080 pixels. It's been cut in half! I want to be able to see as many segments as possible at once. Why not go for the full 4K, with 3840 x 2160 pixels, so that you get decent space in the vertical dimension? After my comment above, I turned on my TV set. The 45" TV monitor was one device I sometimes applied it for translation jobs. As said before, it is not ergonomic. I do not like it. I prefer regular work desk positions since I can work in longer hours with more productivity than such 45" or 50" TV monitor. Maybe you can even get a nice tan while working with that setup if you ramp up the brightness a bit... but other than that, paying something like thrice the cost of a double/triple monitor setup with similar real estate seems a little excessive. I actually look forward to this technology maturing and becoming economically viable. At $1,500 for this bleeding-edge technology, I agree, it's excessive, not just a little. More DPI or more definition (4K or whatever comes down the pipeline) does not necessarily mean it's meant for long periods of sitting work staring at a monitor. Speaking of tanning, I think this monitor offers a real possibility: you could use a “Tanning Booth” luminosity and color scheme and stop working in your payamas. I think my 49" monitor cost $900 including shipping. For something I use nearly every day of the year and for 12 hours a day that is not a huge amount. One good job will cover that payment and I have monitors here that I purchased a decade ago that still work fine. Even if the big monitor only has a useful life of five years that's less than $200 a year. I was specifically referring to e-paper monitors. AFAIK, a 13.3" e-paper (4-bit grayscale) monitor sells at about $1,300 right now. That's not "economically viable" by my standards, but of course, your and others' mileage may vary. My idea of economically viable, in general, is (roughly put): similar performance and functionality at a similar or lower price compared to the average for that class of products. An e-ink monitor that is already on the market. The price is a bit heavy, but I think there is a future in this technology. There have been a lot of interesting kickstarter projects lately, for example a laptop display that can be extended into three separate displays (https://www.kickstarter.com/projects/slidenjoy/slidenjoy-double-or-triple-your-screens?lang=de). Imagine you bring this one to a coffee shop. My favorite is the super ergnonomic keyboard "keyboardio" (https://shop.keyboard.io/). Altough not a monitor it is definitely worth a look. Artsy, yes. Cute? Yes. Ergonomic? Let me try one out for 30 days and I'll let you know.